This has to be one of the odder projects that I've picked up and am pursuing. 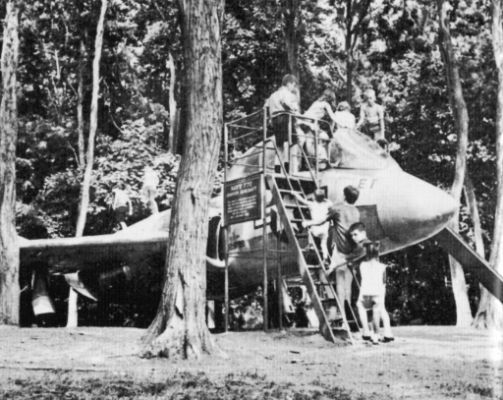 It was very well known and well documented that the Maryland-National Capital Park and Planning Commission used jet fighters as playground equipment in three of its parks: An F7U Cutlass at Wheaton Regional Park in Wheaton, an FJ-4 Fury at Cabin John Regional Park in Bethesda, and a second FJ Fury (not sure which model) at Watkins Special Park in Prince Georges County. The word was that all three were cut up on site and hauled away. Not so fast, though. I recently received information that the F7U at Wheaton was broken up and buried on site. Normally, I would consider this rather far-fetched, as it would seem impractical to bury the plane on site when the Commission had plenty of good trucks to haul the scrap away. However, the source of this information is not only a very reliable source, he also was able to obtain a fourth plane, an F9F-8P that had been acquired by the M-NCPPC for installation at Meadowbrook Park in Bethesda. However, it was never installed and languished in the maintenance yard for 14 years until this gentleman obtained it -- free of charge, no less. In copies of the correspondence that this gentleman had with the Director of Parks, they told him "It's yours if you want it -- at no charge" The gentleman even sent me the letters he received on M-NCPPC letterhead. So, I've started sending out feelers to find some "old timers" from the Commission to see if this can be substantiated. I have learned that the F7U was scrapped before the FJs. It was scrapped in early 1975. According to the letter, the M-NCPPC had to reskin the plane twice because of the abuse it received with kids jumping all over it, and that the internal structure of the plane was failing, so they destroyed it. If this information can be substantiated, I'm disinclined to believe that recovery is going to be a realistic possibility in short term, given how tough it has been to get permission to excavate much smaller holes in the ground at Clarksburg and Beallsville. The only possibility will be like what happened at Clarksburg when extenuating circumstances permitted a dig. Fortunately, the Commission does replace playground equipment on a fairly regular basis, so if and when the equipment is being replaced, we may have an opportunity to recover...again, if this information can be substantiated. I can say that this project has been drawing an overwhelmingly positive response, as many who grew up in the County during the 1970s have very vivid recollections of these planes. Stay tuned. Where is the F9F-8P that was given free of charge to the man now? The transfer would have been illegal because the NAVY retains ownership over its planes forever. This same type of issue has come up before. Another F9F that sat in a AZ park that was sold to a man by a AZ city the NAVY sued to try and get it back. The NAVY lost the case because of the sale terms. The whole thing ended costing the man lots of money , but he won in the end. As far as the F7U Cutlass goes, it would be very worthy to recovery anything you can from it. Currently one is undergoing restoration and they are looking for any parts they can get. It is a rare aircraft. Even cut up and buried, parts could remain usable and could even be valuable. And the parts should not be an issue like a whole plane with the NAVY. -Parts or components bearing a CV10- part number prefix. -Any Westinghouse J-46 engine parts or components. -F7U-3/-3M canopy perspex and windscreen plexiglass panels. Basically I'm saying is be sure to watch out for the NAVY. If they get interested or involved it could complicate matters greatly. Yes, I am familiar with how "Mother Navy" (as Rob Rohr calls them) operates in terms of their aircraft. Yes, my source indicating the F7U is buried is Leon Cleaver, who retrieved the F9F. Cleaver is essentially a Walt Soplata, but has never achieved the level of recognition that Soplata had. There are two main differences: 1) Cleaver has been less reclusive and has been far more open to allowing people to view his collection, in essence, "hiding in plain sight" and 2) He has chosen to liquidate his collection while he is still able to do so. With the exception of a partial T-33, a pair of partial H-19s and an Aero Commander, his entire collection has found new homes. I have a feeling I know where the F7U is. When I heard the plane was cut up and bulldozed, I naturally assumed that there was an excavation and it was buried. However, I have a sneaking suspicion that the plane was left as is and was buried in dirt to create a mound which is now a "king of the hill" playground piece...basically a giant mound that kids can scamper up and down. I'm going to see if I can find some aerial photos of the park to confirm this. You are most likely correct that the plane was buried whole. It is a lot of work to cut up a plane. They most likely bulldozed it and then buried it. Burying planes is a common practice. Outta sight, outta mind. Aerial photos from 1970 were of too poor of a resolution to be any help. I'm going to try to dig up some old park maps from that era. In the meantime, some of my current contacts within the M-NCPPC are going to try to find some "old timers" from this era to see if they can shed some light on it. I figure that considering the number of people I located on the Capital Airlines crash in Clarksburg that was nearly 20 years before, I think I have just as good if not better odds of finding someone who knows the definite answer. I grew up in Bethesda & Rockville, early 70s. We used to play in that Cutlass. If I remember you could crawl through the middle of it and packs of kids were always getting stuck in it clambering over each other. I might be thinking of the Fury but we spent more time at Wheaton. I do remember a slide on it...coming out if the cockpit or somewhere. Chris, your memory is correct. The plane was a hollowed out hulk and you could crawl through the interior. The slide was on the side of the cockpit as shown in the picture. The FJ-4 in Cabin John had a similar set up. The Cabin John bird lasted a few more years than the Wheaton bird. I still don't have much on the one in Watkins Park on the Prince Georges County side, but that one likely met a similar fate. There was a T-33 that was used as a gate guard at Montgomery Airpark in Gaithersburg which is now situated outside an American Legion (or VFW?) in Pocomoke City, Maryland, which is quite the trek. Poking around some pics of the plane and current pics of the park, I think I'm getting closer to the spot. There is a double-kinked tree that seems to be the giveaway to the location. I believe a rest room facility was erected directly over the actual pad that the plane was placed on, and the plane was bulldozed a few feet over where the land has acquired grade where there previously was none. Still trying to come up with a vintage map of the park to see if I'm on the right track. So far, no returns from the feelers sent out to retired park staff, but we're still early in the ball game. If we do discover the plane is buried, I'm wondering if I have a better shot of getting the plane excavated on environmental grounds instead of archaeological / historical grounds. One could argue that when the plane was repainted, we have no idea if parks used lead paint, and therefore it needs to be remediated. Of course, that could backfire and the remediation process could involve smelting anything recovered. Stick with the archaeological / historical grounds for removing the aircraft. The real question is if you find it, then what do you want to do with it? If you can find a new home for it, then dig it out, but not before. But we are getting ahead of ourselves. You gotta find it first and get initial permission for "test" dig to positively ID it. An initial site survey is justifiable per Section 110 of the National Historic Preservation Act. Section 110 actions are management activities that collect data and record basic information about historic properties. The initial superficial survey of the site can include using metal detectors and test digs if the property owners agree. The initial survey stated purpose is to validate the site for further follow on survey of the site. more Section 110 info and forms are available on line. Section 110 only seems to apply to Federal lands and agencies. Wheaton Regional Park is a local park managed by a State agency, the Maryland-National Capital Park and Planning Commission. The Maryland Historic Trust allows for a site to be registered if there is sufficient reason to believe that there are historical artifacts waiting to be uncovered. However, there is no obligation for the land owner or custodian to allow detecting or digging. The site can only be designated a Historical Archaeological Site only after artifacts are recovered. The only time either of these truly comes into play is if the land is slated to be used for a project where federal or state funds are being used. If that is the case, then the site would need to be cleared through an archaeological dig before any construction could proceed. If the land is used or purchased by private entities, the Historic Archaeological Site designation will not stop the development. The M-NCPPC operates the College Park Aviation Museum, and I'm thinking that I should reach out to them and see if there could be any kind of tie-in to the museum with some of the work that I've been doing on park lands. UPDATE: I did get someone to substantiate the story that the F7U was buried on site. However, it only remained underground for a short period of time. Apparently, the plane was excavated and the parts were used for another F7U being restored. I don't know the identity of the other project. I'm thinking it has to be either a gate guard, or perhaps it was for the Pensacola bird, as there weren't too many people restoring F7Us in the mid-1970s. I am working on an article about the "playground birds" of Montgomery County, Maryland. It's amazing how much of a chord they strike with people who played on them as kids. Poor jet. It looks like an art project with chicken wire and paper mache. Concerning F7U, I remember as a 70's kid gazing at the F7U in Travel Town in Griffith Park, Los Angeles. Such a futuristic looking jet. That F7U-3M was taken back by the Navy and is now the Pensacola museum bird. With its protective casing just like a mummy it will last a long time. The Palm View Park F-86 will be the last surviving F-86D a thousand years from now, long after all the others have corroded away.